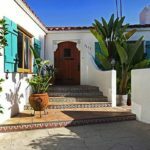 Spanish Revival architecture flourished in California from the 1920’s to the 1940’s and has so much appeal and is so well suited to Southern California that new Spanish Revival homes have never stopped being built in and around Los Angeles. Its inception dates back to the Panama-California Exposition which was held to celebrate the opening of the Panama Canal. The exposition ran from 1915 to 1917 in San Diego. Bertram Goodhue and Carleton Winslow were the architects who designed the exposition buildings. Their goal was to build on the Mission Revival style which was very modest and add more ornate elements borrowing from Spanish Baroque along with Islamic and Persian styles of design. In the early 20’s whole towns adopted the style to give a unified look to their city. Rancho Santa Fe in San Diego is one example and after a large earthquake in 1925 Santa Barbara became another. 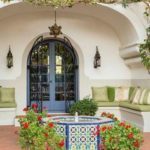 Spanish Revival is typified by tiled roofs, stucco walls, arched doorways and windows, tiled patios, ornate tile work, wrought iron railings and fixtures, exposed wood beams, woodwork, ornamental fountains and courtyards. The Adamson House in Malibu, designed by Stiles O. Clements in 1929, is one of Los Angeles’ most famous residential examples. 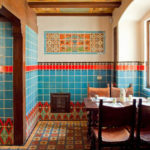 It is known for its extensive use of locally produced tile. Fine examples in commercial building also add character to our city. The Beverly Hills Hotel, the Beverly Hills City Hall, the Pasadena Playhouse, much of the Paramount Pictures lot, and Union Station are some the landmark non-residential uses of Spanish Revival. Notable Spanish Revival architects in California include: Bertram Goodhue, Carleton Winslow, John Byers, Elmer Grey, Reginald Johnson, William Johnson, Julia Morgan, Lilian Jeannete Rice, William J. Gage, Stiles O. Clements, and Parkinson & Parkison. 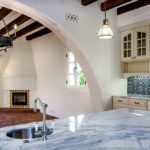 Today in California architects such as Kevin Clark and Marc Appleton are still creating Spanish Revival gems. I personally live in a Spanish Revival home which my wife and I will be remodeling for years to come. We try to do all the work on the house with a mindset of how can we make this true to the Spanish Revival style although we are open to modern interpretations as well.